The Eagles' defensive line must introduce Tom Brady to the U.S. Bank Stadium turf early and often. As we noted on Tuesday, the Philadelphia Eagles will have a number of favorable matchups against the New England Patriots when the Eagles have the ball. They will face a far bigger challenge when Tom Brady and the Pats' offense take the field. Here are five matchups to watch when the Patriots have the ball. That objective has served Jim Schwartz well all season long, however, when looking at the Patriots offense, "WE HAVE TO STOP THE RUN" isn't the first thing that typically pops into observers' heads. Patriots center David Andrews explained why the Eagles' defense is so effective stopping the run. "One, it's just guys paying their techniques," he said. "They're very sound schematically. That's a big thing, and it's where it all starts, to have guys not giving up their gaps or anything like that. And then on top of that, they're good players. That's a good combination to have." The Eagles owned the trenches in 2017. Here's a look at each team's differential in rushing yards vs. rushing yards allowed each game. As you can see, the Eagles should have a significant advantage in the run game, generally speaking. Brady is going to make his share of plays. That's a given. The Eagles cannot also let the Patriots have success on the ground. It is my belief that they should stick to the formula that got them here, which is to shut down the run game, first and foremost, and then get after Brady. While none of the Patriots' running backs are world-beaters in between the tackles, they are heavily involved in the passing game. Lewis, Burkhead, and White combined for 118 receptions this season, and White actually had more receptions (56) than rushes (43). "We like our matchups against any linebacker, with any of our running backs, so we're definitely looking forward to taking advantage of those," said Lewis. The Patriots use their backs in the passing game as something of an extension of their run game, but don't often hit big plays. The three backs noted above averaged a modest 7.6 yards per reception, with the long reception on the season going for 27 yards. Mychal Kendricks and Nigel Bradham have been good in coverage all season long. They should be very busy trying to track down the Pats' trio of pass-catching backs all game, but this is not the matchup disadvantage that it used to be when Kendricks really struggled covering backs. Cooks is a speed demon. At the 2014 NFL Combine, he ran a 4.33 40, and put up some of the best shuttle times in NFL Combine history. Late in the regular season, the Eagles got beaten by a bunch of double moves that turned into huge plays for opposing offenses. If the Eagles' corners are going to gamble, they would be wise to think twice about gambling against Cooks, who is capable of game-changing plays. 4) How do you cover Gronk? As of Wednesday night, Rob Gronkowski still has not yet cleared the concussion protocol, though it is expected that he will. The Eagles will need a plan for him, obviously, as Gronk is very clearly the best tight end in the NFL, and maybe the best ever. #Analysis. Are the Eagles building the best scouting department in the NFL? In Week 2, Chiefs stud tight end Travis Kelce put up good numbers against the Eagles' defense, as he caught 8 passes for 103 yards, and a TD. Kelce bears a closer resemblance to Gronk than anyone the Eagles have faced this season. In that game, the Chiefs did a lot of creative things to get the ball in Kelce's hands, such as a shovel pass that went 15 yards for a score, and some quick screens, but the only time Kelce really beat a defender man-up was when he was able to shake Malcolm Jenkins down the sideline for a 44 yard gain. Certainly, the Eagles will bracket Gronk on occasion, particularly in the red zone, but there will be times when an Eagles defender will be asked to lock him down on his own. No matter who the Eagles choose to cover Gronk when they are in man defense, they will be giving something up. If they put Jenkins or a third safety like Corey Graham on Gronk, they'll be giving up size. If they put a linebacker on him, they're giving up a higher likelihood of separation... and also, size again. If I were Jim Schwartz, I'd be more inclined to cover him with Jenkins or Graham and make Brady and Gronk beat me with good ball placement and contested catches, rather than upping the odds of Gronk running free through the secondary against Bradham or Kendricks. Tom Brady was sacked 35 times this season. Since he became the starter in 2001, he has taken an average of 28 sacks per season. In other words, he has had better offensive lines protecting him. 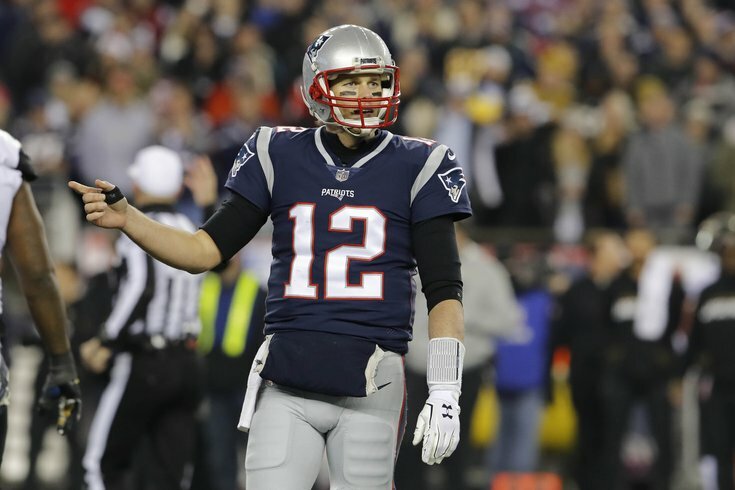 In 2015, Brady was sacked 38 times during the regular season, and they were ultimately beaten in the playoffs by a Denver Broncos defense that spent the entire day in the Pats' backfield. Brady believes that the Eagles have the best defensive line they will see all season. "The D-line is I think better than anyone we’ve faced all year," he said. "Fletcher Cox is an incredible player, but they’re all really talented. They all play really well together. They’ve got a great scheme that mixes in well with their coverages. They’ve been playing well all year, and that’s why they’re in this game." Well, once again, with Wentz out, the defensive line is the strength of the team, and they are going to have to get after Brady in order to win. Defensive lines have carried teams to championships in recent history. The Giants’ two unexpected Super Bowl runs were both fueled by their defensive lines, as was the aforementioned Broncos’ of a couple years ago. Cox, Brandon Graham, Timmy Jernigan, Vinny Curry, Derek Barnett, Chris Long, and Beau Allen have to go out and put the team on the defensive line’s back for one more game.